Social Strategy: Live Memeing Can Deliver Increase in Organic Facebook Page Likes and Reach! With 890 million daily active users on Facebook, of those users only 33.8% click the like button on a post, while 26.7 will click the share button, this platform can be a tricky space for business. Working as a content creator/editor in the digital space, the promotion of content on social platforms in hopes to obtain clicks or referrals back to the site is war, everyday begins a new battle. Although typically I win the war, I will say trial and error is what determines the outcome of the daily conquest. My recent battle, the battle of all battles for someone overseeing a plethora of music and pop culture content populated sites, The 57th GRAMMYs. In previous years, many of my properties and other relevant outlets have seen much success in brand reach and engagement in early February due to live tweeting during the airing of the award show. Live-tweeting (verb) ↪️ presently posting comments to twitter about an event while the event is taking place. Social media and live events go hand-in-hand. Everything from conferences and award ceremonies, to television shows and sporting events are talked about on social. Thanks to its real-time focus, Twitter has become a hub for consumer conversations centered around live events. What business wouldn’t want to be in the middle of all that engagement? Over the years, we’ve seen many brands work live-tweeting into their outreach strategies in an effort to transform those chats into new fans and customers. Live-tweeting can be an incredibly powerful way to drive conversations around an event and building a lasting audience on Twitter regardless of industry or size. But before you start tweeting about just any event, here are a few best practices to consider. Every second around 6,000 tweets are sent, which makes it a challenge to make a lasting impression on Twitter that will live on beyond the moment. Granted success is obtainable via re-tweets and replies during a live event, it occurred to me that the method of live-tweeting when applied to Facebook when considering the combination of Facebook’s most recent algorithm change effecting optimization of posts, higher click through rates and the average length of time spent on Facebook (21 minutes) may garner bigger gains. Being that Facebook engagement thrives on media associated with a post, including a photo or video with the posts is essential. Thus, live-memeing was born. Thank @IAmGWoods for coining the phrase. Associating links of red carpet photo galleries and related content to the memes created by my Social Media Manager @IAmGWoods and I, HOT 107.5’s Facebook Fan Page‘s reach of 5.7 million grew to 7.2 million(26%) by the end of the GRAMMYs televised show. By the following morning when many of our Facebook status were actively viral, our reach grew to 14.6 million, or 156% increase and the site’s traffic was through the roof. Amazing results for short term success. Long term success and consumer loyalty! The live-memeing strategy increased our Facebook fans. 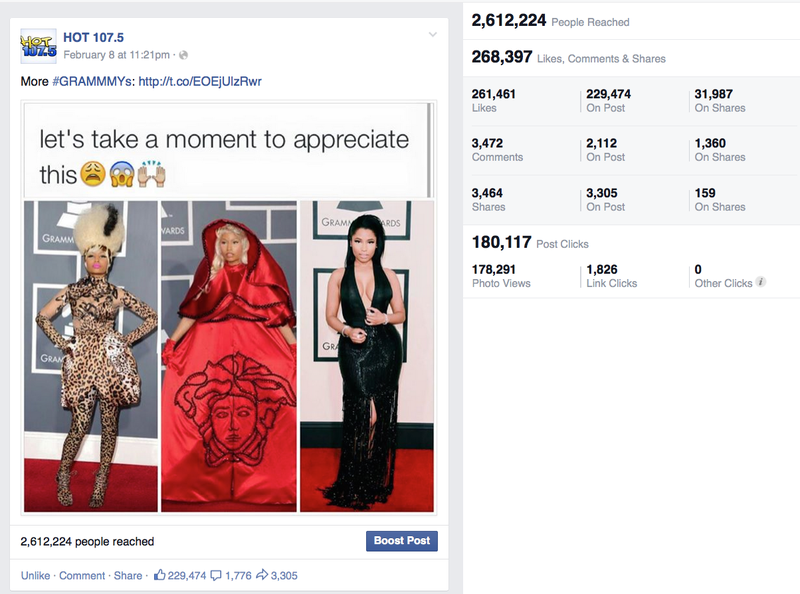 HOT 107.5’s Fan Page garnered a 5.4% increase in page likes at show’s end, with a 10% increase by the next morning. These are people we can further engage on a daily basis to build better consistent relationships with our consumers as well as continue engagement and increasing the brand’s reach. Cause and effect at its finest! Not in the entertainment industry? Don’t Fret! You too can benefit by tuning your business into TV conversations. Even if your brand isn’t in the entertainment industry, there’s no reason you can’t participate in some of the social conversations happening around television. Plenty of brands have created big social wins out of being present during a televised event and creating relevant, retweetable messages that leverage the number of people tuned in to social networks during these big events. Just be sure to keep your messaging brand-relevant and to avoid potentially offensive content, which will garner the wrong kind of social attention. Nielsen’s stats say that minorities, in particular, are on the leading edge of social TV watchers, with social driving more Hispanic, Asian, and African-American audiences to television than the average, which could make social messaging especially important to reach those demographics. Posted in Strategy and tagged live memes, live tweeting, live-memeing, what is a meme, What is live tweeting, what is live-memeing. Bookmark the permalink.